Note: The core SONAR installer does not include all available plug-ins. If the plug-ins listed in this section are not available in SONAR, please download and install the optional plug-ins via Cakewalk Command Center (see Cakewalk Command Center). DirectX and VST audio effects. Plug-ins are displayed according to their organization in the selected Plug-in Layout. Custom plug-in layouts let you organize plug-ins any way you want: alphabetically, by vendor name, by effect type, etc. Effects can be added to tracks, buses and clips. Instruments can be added to audio tracks, Instrument tracks and the Synth Rack. Show Plug-in Browser . Show the Plug-in Browser. Audio. Show available DX and VST audio effect plug-ins. MIDI. Show available MFX MIDI effect plug-ins. Synth. Show available DXi and VSTi soft synths. ReWire. Show available ReWire devices. Manage Layouts. Opens Cakewalk Plug-in Manager, which lets you create, delete, and edit plug-in layouts. For more information about Cakewalk Plug-in Manager, see the Cakewalk Plug-in Manager online Help. Sort by Category. The default layout, which organizes plug-ins into category subfolders such as EQ, Dynamics, Reverb, etc. If a plug-in has more than one category, it will be listed in each category subfolder. For information about assigning and creating categories, see To assign a plug-in to an existing category and To create a new custom plug-in category. Sort by Manufacturer. Sort plug-ins alphabetically by manufacturer name. Sort by Type. Sort plug-ins by their native format (VST3, VST2, and DirectX) and manufacturer. Scan VST Folders. Scan to detect if any VST plug-ins have been added or removed. <list of layouts>. 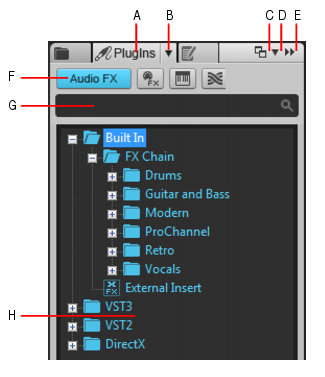 The Plug-in Layout menu lists all layouts stored by Cakewalk Plug-in Manager. Select a layout to change the plug-in list. Search filter. The search filter allows you to only show plug-in names that includes a specific text string. Plug-in list. The Plug-Ins list is populated from the currently-selected layout from the Plug-in Layout menu and the plug-in type selected from the Plug-in Type menu.